Deathwing the Destroyer - Formerly known as the Earth-Warder Neltharion, was one of the five Dragon Aspects whom was gifted by the Pantheon ages ago. Neltharion was granted dominion over the earth and as such; over time - The Old Gods began influencing him as they hid and lived deep down beneath the surface of Azeroth, whispers and words of chaos eventually broke the Earth-Warder's mind and he ended up turning against the other Aspects and life itself, becoming one of the greatest Terrors Azeroth had ever seen. Trough his many years as a driving force behind chaos across Azeroth; Deatwhing achieved many things, among them was acts such as - Being part of why the Dragon Soul turned into the Demon Soul, attempting to destroy the Alliance from within during the Second War, turned his former sister and fellow aspect Alextrasza into a slave for the Horde, made his former mate Sinestra turn into nothing more than a tool to give live to the newly established Twilight Dragonflight and in general just caused havoc across the world of Azeroth. Deathwing was however eventually defeated by the other Aspects - Yet he was not slain; after retreating to Deepholme; he recuperated, gained his strength back and was patched together by the help of the Twilight's Hammer cult and would soon enough set out to wreak havoc upon Azeroth once more by destroying the World Pillar and gaining strong allies in his journey too destroy the world, among these the crazed ogre-mage Cho'Gall and Elemental Lords like Ragnaros and Al'Akir. Ultimately Deathwing met his end by the hands of the Adventurers of Azeroth with the help of the Aspects who had journeyed back in time to retrieve the Dragon Soul - And by sacrificing their powers and gaining great assistance by the new Earth-Warder; Thrall - They were able to kill Deathwing mere moments before he could break the world of Azeroth. As the Nexus called upon Deathwing - He arrived with a mind free from the Old Gods influence, yet despite this - His past self is who he is now, having done horrific acts that can never be forgotten or forgiven; Deatwhing looks to approach the Nexus in a more strategic way, and one day - he may just put this new realm he finds himself within underneath his wings. Deathwing is an extremely sturdy frontline Warrior who uses his Dragon Aspect powers and still lingering Earth-Warder powers to protect himself from harm and to disrupt the ground around his enemies, causing the earth to shake no matter where he goes. Much like Alextrasza - He can use his Trait (D) to transform into his Dragon Form for a brief period of time. Deathwing attacks in his Human form using a Two-Handed mace created from his Earth-Warder powers. 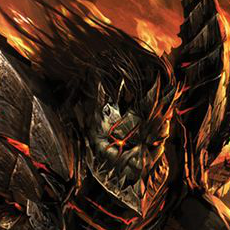 Passive: Deathwing gains 15 Armor for the duration of any type of crowd controlling effect that is cast on him. Activate: After 1.25 seconds, transform into a Dragon which grants 10 Armor and gain 750 health. While Destroyer of Worlds is active, Deathwing's basic abilities are empowered, his basic attacks deals 160 damage to all hostile units in an arc in front of him. Allied heroes who is hit by the cone of Deathwing's basic attack while in this form gains 15 armor for 1,5 seconds should they be under a crowd controlling effect when the basic attack splashes over them. Lasts 15 seconds. Interrupting the Transformation places this ability on a 10 second cooldown. The moment the ability is successfully cast, and upon transformation back to human form, Deathwing enters a special Stasis for 0.5 seconds, removing debuffs and becoming invulnerable and untargetable for this period. Slam your mace into the ground in front of you, dealing 120 (+ 4% per level) damage to all hostile units within close proximity of the mace-head's point of impact. After the mace strikes the ground, an earth fissure will form in a line in front of where the mace struck the ground. After 1 second, the fissure will collapse inn on itself, stunning all hostile units caught in it for 1 second and dealing 55 (+ 4% per level) damage. Cause for the earth to rumble within an selected area for 1,25 seconds, slowing the movement speed of anything hostile within the area by 20%. After the 1,25 seconds has passed - The ground will break and a volcanic burst will erupt, dealing 85 (+ 4% per level) damage and slowing the movement speed of anything hostile within range by 30% for 1,5 seconds. The area that the volcanic burst affects is larger than the initial rumbling area. Cover yourself in barbed and reinforced Dragon Scales for 3 seconds, causing you to gain 15 Armor for the duration. While Barbed Plating is active - Any basic attack damage received within 2 range will be mirrored back to the attacker. Slam the ground with your front legs, dealing 160 (+ 4% per level) Damage to all hostile units within close proximity of the legs point of impact. After slamming the ground, cause for a set of earth pillars to burst up in a straight line in front of yourself, dealing 90 (+ 4% per level) damage to anyone hit by the pillars and stunning them for 1.25 seconds. Cause for an volcanic eruption to take place at your chosen location after 1.5 seconds, dealing 125 (+ 4% per level) damage to anything hostile hit and slow their movement speed by 30% for 2.5 seconds. During the 1.5 seconds leading up to the eruption; anything within the eruption area will be slowed by 10% and will take 39 (+ 4% per level) damage for each 0.5 seconds they remain within the area. After the eruption has taken place, molten lava will slowly fill out the eruption area, causing 105 (+ 4% per level) damage per second to anything within the lava. These areas remains active as long as Deathwing remains within Dragon Form. Cause for molten spikes to erupt from pars of your Dragon Scales for 4 seconds, causing for Deathwing to deal 45 (+ 4% per level) damage to all hostile units within close proximity of himself. Targets hit by this damage will have their armor reduced by 5 per tick of damage they take. The armor reduction lasts for 1.5 seconds and refreshes whenever damage is taken beyond the first application. After 1.25 seconds, take to the skies for 13.5 seconds and cause for the beginning of the cataclysm - causing for numerous areas around the battlefield to be set ablaze, dealing 125 (+ 4% per level) damage per 0.5 seconds to anything hostile within the areas which is set ablaze. 1 Second after taking to the skies, you will periodically breathe spurts of fire for 1.5 seconds which will set ablaze whatever area your mouse cursor is moving along while breathing fire. After breathing fire, it will be 1 second before another breath of fire will be started. After breathing 5 waves of fire - You will land after 3 seconds at the point where your mouse cursor is. Fire breath and landing point has global range - The fire will be placed and Deathwing will land wherever your mouse cursor is when either action is taken, regardless of vision within the area. Once the fire breath begins, your mouse cursor will have it's momentum and possible movement limited. This limit breaks during the 1 second downtime in between breaths. Fire breath has a radius of 5 and will be able to travle for a range of 15 while active. Deathwing transforms into his Dragon Form and becomes unstoppable for 5 seconds. During the unstoppable period, Deathwing can not use abilities but allies of Deathwing can click on him to climb onto his back, removing them from harms way. After the 5 seconds is over, Deathwing will take to the skies and will freely be able to fly around - following the mouse cursor for a maximum of 10 seconds. While up in the sky, Deatwhing casts a large shadow underneath him and will gain vision within the area his shadow covers. You can re-activate this ability before the 5 seconds ends to take off immediately. You can re-activate this ability to do an assault like crash landing at the mouse cursors location - Dealing 375 (+ 4% per level) damage to anything hostile within the landing area. Once landed, Deathwing will remain within Dragon Form for 10 seconds and all allies on his back will jump off him, gaining 25 Armor for 3 seconds once they re-gain control of themselves. Landing area damage radius: 4. The movement speed of the mouse cursor is somewhat limited while airborne. Whenever Deathwing has armor - Earthshatter Strike deals 75% more damage. Quest: Gathering Regeneration Globes increases your maximum health by 20. Reward: 30 Globes: Regeneration Globes grants Deathwing 10 Armor for 5 seconds. Damaging enemy heroes with the eruption of Groundbreaker will reduce the cooldown on Destroyer of Worlds by 3 seconds per hero struck. Enemy heroes damaged by the fissure collapse of Earthshatter Strike will take bonus damage equal to 5% of their total maximum health. Groundbreaker instantly destroys minions and mercenaries. Refund 2 mana for each unit killed by Groundbreaker. Increase the eruption area for Groundbreaker by 10% per hostile hero within the rumbling area just before the eruption takes place. Hitting enemy heroes with basic attacks or the mace impact area of Earthshatter Strike will heal Deathwing for 2% of his total health. Basic attacks slows the targets movement speed by 15% for 1.5 seconds and reduces ability cooldowns by 0.3 seconds. Basic Attacks mirrored back by Barbed Scales will heal Deathwing for 25% of the damage. Earthshatter Strike's mace impact and fissure collapse will cause damaged heroes to lose 15 armor for 3 seconds. Groundbreaker's eruption will deal 10% more damage to enemy heroes hit per 0.25 seconds they remained within the rumbling area prior to the eruption. Any hero who takes more than 30% increased damage will have their damage dealt and attack speed reduced by 35% for 4 seconds. Deal 14 damage per second to nearby enemies. While Barbed Scales is active - This effect deals 110% more damage. Increase the duration of Destroyer of Worlds by 7 seconds. Activate to gain 50 Spell Armor for 4 seconds. Upon expiration, you will heal for 75% of the damage taken over 4 seconds. If the damage taken while the Spell Armor is active equals more than what would have been 35% of your total health without the armor active; You will gain 35 Spell Armor while healing over time from this effect. Passive: Summons near Deathwing is forced to attack him but they deal 75% less damage to him. Activate: Increase the attack speed and movement speed of nearby allied heroes by 15% for 3 seconds. For each allies hero affected; gain 5 Armor for the duration of the roar. Enter Dragon Form for 3 seconds upon landing after Cataclysm ends. For each tick of fire damage enemy heroes tok during Cataclysm; the Dragon Form will last for 0.5 seconds longer. Upon landing with Earth-Warder's Assault; any hostile hero damaged by the impact landing will be picked up by Deathwing's jaws. After 2 seconds, Deathwing will re-activate Earth-Warder's Assault and take to the skies again. Re-activating the ability now will not land Deathwing again but will instead drop down any hostile heroes taken along at the targeted location. Deathwing will now land after the 10 seconds expires at your mouse cursors location. Activate to grant an allied hero 15 Armor until they die. Cannot be used on Deathwing or on a hero who already bears this mark. Deathwing takes to the skies and casts the shadow of his Dragon Form over the entire battlefield. He then begins a 15 second channel which when complete; will kill anything living thing outside of the Nexus Home. This ability bypasses Stasis and Immunity spells. Characters in stasis-like effects (Re-call, Gorge, Devour Maw) will also be killed if not inside the Nexus Home. Apart from his base appearance I can't really think of anything that would "suit" him as his Dragon and "broken" like appearance is what defines Deathwing. I figured maybe a skin which had him take on his pre-corruption appearance but I do not really have any GOOD references for that. As for his base skin; it would of course have different tints - I figured one Purple themed one due to his connection with the Twilight Dragonflight and any other tint would work but they could not really be Blue, Green, Red or "Bronze" due to those "belonging" to other Dragonflights. I will list here once more of my concepts is made. Some of these concepts may also look familiar but that is because I am also "Rexx" whom has posted some hero concepts on the EU and US side forums for Heroes of the Storm. This Deathwing concept was started sometime during fall of 2018 but was mostly just put in note-block format on my PC. It never went onto Heroesfire before the day it was posted here. 04.02.2019: Concept created and posted - Most of this concept has been worked on from time to time without me having been smart enough to note it down so.... Boom! Level 4: Destroy the weak- it shouldn't insta-kill mercs. Crushing Earth- maybe move to a higher tier, because having max health percentage damage this early can be very oppresive, especially for tanks like Stitches, Muradain, Diablo, Mal'ganis etc. Level 16: Draconic roar- the passive effect stright up destroys any hero that relies on summons (Rexxar, Zagara, Xul, Gazlowe etc). I suggest making it a different active talent on X seconds cooldown and maybe dealing 50% less damage instead of 75%. Level 20: I am the cataclysm- first of all, if deathwing rises up to the sky and then channels, wouldn't that make him untargetable, and therefore make the channeling uninterruptable? Second, I can this talent being used in such a troll fashion, where he purposefully kills his team whether after a won team fight pushing for the win or something. Not to mention how killing your own team, as well as literally everything else on the map, even leashed mercs and bosses can create pretty nasty bugs and glitches. I think it should be removed. Other than that, nice job on the concept. 26036 InfernoPunch400 I really like the idea, but I find some of his talents either broken, or really uninteractive. Those being- Level 4: Destroy the weak- it shouldn't insta-kill mercs. Crushing Earth- maybe move to a higher tier, because having max health percentage damage this early can be very oppresive, especially for tanks like Stitches, Muradain, Diablo, Mal'ganis etc. Level 16: Draconic roar- the passive effect stright up destroys any hero that relies on summons (Rexxar, Zagara, Xul, Gazlowe etc). I suggest making it a different active talent on X seconds cooldown and maybe dealing 50% less damage instead of 75%. Level 20: I am the cataclysm- first of all, if deathwing rises up to the sky and then channels, wouldn't that make him untargetable, and therefore make the channeling uninterruptable? Second, I can this talent being used in such a troll fashion, where he purposefully kills his team whether after a won team fight pushing for the win or something. Not to mention how killing your own team, as well as literally everything else on the map, even leashed mercs and bosses can create pretty nasty bugs and glitches. I think it should be removed. Other than that, nice job on the concept. My intention behind the Destroy The Weak talent was more of a notion toward that I feel like in too many games the "off tank" ends up having to deal with Mercenaries and minions and this tank is not always a Sonya for instance so I just wanted for Deatwhing to have an option so strong that it could competed with the other talents - Seen as if it just did bonus damage I feared it would just be another "flash in the pan" kind of talent. Crushing Earth is something I reckoned would be just fine seen as how for instance Stitches himself has a 5% health chop talent option at level 4 in the form of his Serrated Edge talent which also reduced hook cooldown on impact - Limiting the % damage to only when the fissure collapses instead of when it forms / by the initial strike was something I hoped would not be TOO big a deal considering how there is time to move away from it. Sure Stitches's hook can only hit one target but usually it hits something, this talent is not "that" guaranteed to give results all the time. A: I did not realize that Misha counted as a summon, I figured Misha was in "his own" category seem as how the bear gives XP upon being killed and so on. As for the other mentioned heroes; That was sort of my point - I feel like some heroes have REALLY strong Summons like especially Zagara's talented Hunter Killer; So I just wanted to see a hero emerge who was able to reliably shake there off whoever DPS or Support that get's that deadly monster pinned onto them. But your idèa for how to change it certainly is not a bad one, I like it pretty much to be honest. I am the Cataclysm was designed just to allow players to FEEL lik Deathwing and yes; he is untargetable when casting it so he can not be stopped, yet his entire shadow covers the stage and an announcement will be cast WHEN it happens so it's no way that anyone could MISS this being started. The idèa was indeed that it would kill ANYTHING; Allies and all - But with it's 15 second cast time; everyone should be able to cast Hearthstone and so on: it was designed with the idèa of that he pretty much just "ends the world" and after that it is a mad scramble for the teams to run out and capture all the now open merc camps and so on. Yet since it "punishes" both sides; I figured it could go along as long as it's cooldown remained AT LEAST 180 seconds, if not longer. Mostly I figured it would be used as a "stalling tool" more than anything tho and most camps is taken on rotation late game anyway so it was more a "flavor" ability more than something I think can REALLY turn games around seen as yeah; most games by 20 is already in a position where this talent will just "stall" the battle or just negate some general actions to be taken. 26037 Rexx First of all; thanks for taking the time to read the concept and giving it some constructive feedback. As for the talents: My intention behind the Destroy The Weak talent was more of a notion toward that I feel like in too many games the "off tank" ends up having to deal with Mercenaries and minions and this tank is not always a Sonya for instance so I just wanted for Deatwhing to have an option so strong that it could competed with the other talents - Seen as if it just did bonus damage I feared it would just be another "flash in the pan" kind of talent. Crushing Earth is something I reckoned would be just fine seen as how for instance Stitches himself has a 5% health chop talent option at level 4 in the form of his Serrated Edge talent which also reduced hook cooldown on impact - Limiting the % damage to only when the fissure collapses instead of when it forms / by the initial strike was something I hoped would not be TOO big a deal considering how there is time to move away from it. Sure Stitches's hook can only hit one target but usually it hits something, this talent is not "that" guaranteed to give results all the time. Regarding Draconic Roar: A: I did not realize that Misha counted as a summon, I figured Misha was in "his own" category seem as how the bear gives XP upon being killed and so on. As for the other mentioned heroes; That was sort of my point - I feel like some heroes have REALLY strong Summons like especially Zagara's talented Hunter Killer; So I just wanted to see a hero emerge who was able to reliably shake there off whoever DPS or Support that get's that deadly monster pinned onto them. But your idèa for how to change it certainly is not a bad one, I like it pretty much to be honest. I am the Cataclysm was designed just to allow players to FEEL lik Deathwing and yes; he is untargetable when casting it so he can not be stopped, yet his entire shadow covers the stage and an announcement will be cast WHEN it happens so it's no way that anyone could MISS this being started. The idèa was indeed that it would kill ANYTHING; Allies and all - But with it's 15 second cast time; everyone should be able to cast Hearthstone and so on: it was designed with the idèa of that he pretty much just "ends the world" and after that it is a mad scramble for the teams to run out and capture all the now open merc camps and so on. Yet since it "punishes" both sides; I figured it could go along as long as it's cooldown remained AT LEAST 180 seconds, if not longer. Mostly I figured it would be used as a "stalling tool" more than anything tho and most camps is taken on rotation late game anyway so it was more a "flavor" ability more than something I think can REALLY turn games around seen as yeah; most games by 20 is already in a position where this talent will just "stall" the battle or just negate some general actions to be taken.